A GROUP of Karoo residents has accused oil company Royal Dutch Shell of being “untruthful and misleading” and has lodged a complaint over an advert which tries to allay public fears about its fracking exploration technique . Shell scared away by British tax? LONDON, April 29 (UPI) — Royal Dutch Shell suggested it might pull out of developments in the North Sea because of a tax increase imposed by the British government, a director said. British Chancellor of the Exchequer George Osborne imposed a duty on oil and gas producers in an effort to take advantage of massive oil profits reported by international energy companies. SHELL is slashing investment in the North Sea over a Budget Day tax hike – despite making £1.9million an hour. The giant yesterday revealed the rise meant it was now “uneconomic” to develop smaller UK oil and gas fields. Shell’s quarterly profits were up forty per cent and totalled £4.1billion. ROYAL Dutch Shell warned yesterday that it may have to sell some assets in the North Sea and reduce investment in the region because of the Chancellor’s tax raid and higher industry decommissioning costs in the Budget. Simon Henry, chief financial officer, revealed that the changes could cost the group $1 billion (£600m) in extra charges, a similar sum to that facing rival BP. He said that Shell had taken a $60 million hit in the first quarter of this year on the extra tax levy on North Sea production and would face a further $150m impact over the rest of 2011. There will be another $400m charge in 2012. In addition, reduced tax breaks for decommissioning rigs was likely to lead to another charge of up to $500m. “It’s a fact of the business we are in. Not just governments but suppliers look for a share of higher revenues,” Henry said. THE chief financial officer of Royal Dutch Shell has warned , the surprise hike in tax on North Sea profits will hit investment in the area, after the company unveiled a 30% leap in profits on the back of surging oil prices. Simon Henry said the hike, announced by George Osbornes had already impacted on planning. and it may result in the company investing much less in future than it would have done. One of the most striking features of the oil industry in recent times has been the divergent fortunes of Royal Dutch Shell and BP. 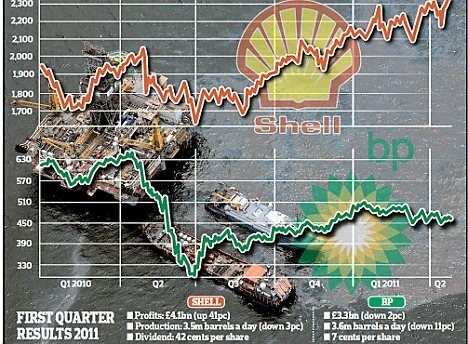 The past two years has seen Shell outperform the All-Share index by 7pc, while BP has under-performed by 58pc. Results on Thursday from Shell once again underlined the companies’ differences, such as profitability and prospects, which are driving investor sentiment. In the battle of the UK super majors, the first leg of 2011 belongs to Shell by a considerable margin, said Richard Hunter, head of UK equities at Hargreaves Lansdown stockbrokers, yesterday. It is easy to see why. While BP is plagued by the toxic legacy of the Gulf of Mexico oil spill and troubles in Russia, Royal Dutch Shell powers on. Royal Dutch Shell‘s bump in the road has sure flattened out. The oil company’s first-quarter earnings were up 53% on a disappointing last quarter of 2010, thanks to high oil prices and improved liquefied-natural-gas sales in Asia and Europe. Stronger cash flow may have some investors pressing for higher dividends. Shell should resist, for now. ANCHORAGE, Alaska (AP)  The federal agency overseeing offshore drilling in Alaska says a worst-case scenario for a blowout in the Chukchi Sea lease area could put more than 58 million gallons of oil into Arctic waters. That’s far more than the major leaseholder in the Chukchi, Shell Oil, says it could handle under its response plan. LONDON (Dow Jones)–Royal Dutch Shell PLC (RDSB.LN) Thursday posted a consensus-beating 30% rise in adjusted profit for the first quarter, as high oil prices, upstream production growth and continued cost-cutting all combined to good effect. Royal Dutch Shell Plc (RDSA), Europes biggest oil company, said profit rose 30 percent in the first quarter as crude prices gained and refining earnings doubled. Shell’s president for US operations on Tuesday called talk of exporting shale gas premature, at least politically. Royal Dutch Shell Plc (RDSA) is being blocked from offshore oil and gas exploration in Alaska by the irresponsible delays of federal regulators, said the companys U.S. president, Marvin Odum. Shell, based in The Hague, has spent more than $2 billion for hundreds of drilling leases in Alaska since 2005, and has invested $1.5 billion on an exploration program that exceeds current regulatory requirements, Odum said. We have received the latest installment of Shell internal communications relating to this website and its owners. The information has been supplied in response to a Subject Access Request to Shell under the Data Protection Act. As always, there is some information which Shell would not want put into the public domain. Shell Oil Company has announced it must scrap efforts to drill for oil this summer in the Arctic Ocean off the northern coast of Alaska. The decision comes following a ruling by the EPAs Environmental Appeals Board to withhold critical air permits. The move has angered some in Congress and triggered a flurry of legislation aimed at stripping the EPA of its oil drilling oversight. SHELL Ireland has received a further cash injection of 60 million from its parent company to complete the Corrib gas field project. This brings to 190m Shell E&P Ireland Ltd (SEPIL) has received in additional cash in recent months as it prepares to wrap up the final phase of the project, that includes the construction of a 5km tunnel to bring gas ashore in north Mayo.